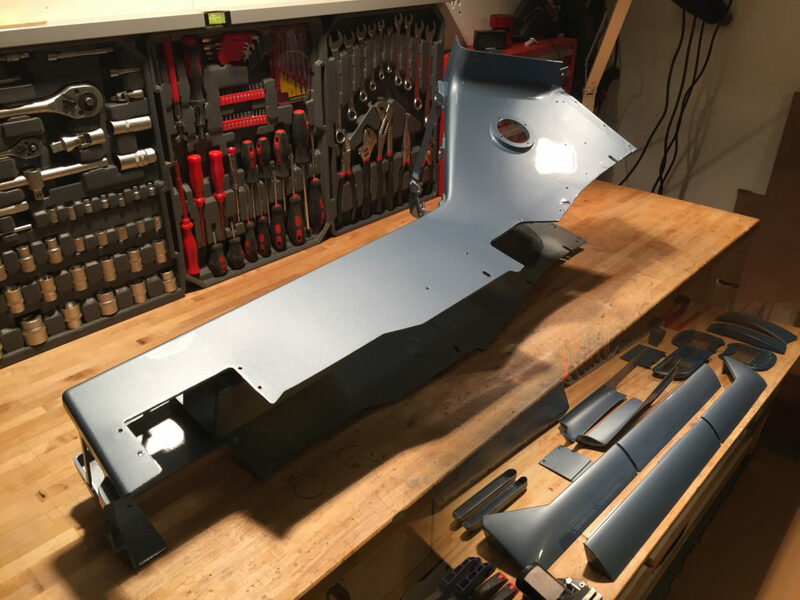 In recent articles, I have explained step by step how to restore the door and the rear side panels of a first generation model. Now the center console is to be restored. First, remove the console very carefully. Don’t forget, the material is over 50 years old and can be very brittle in some places! 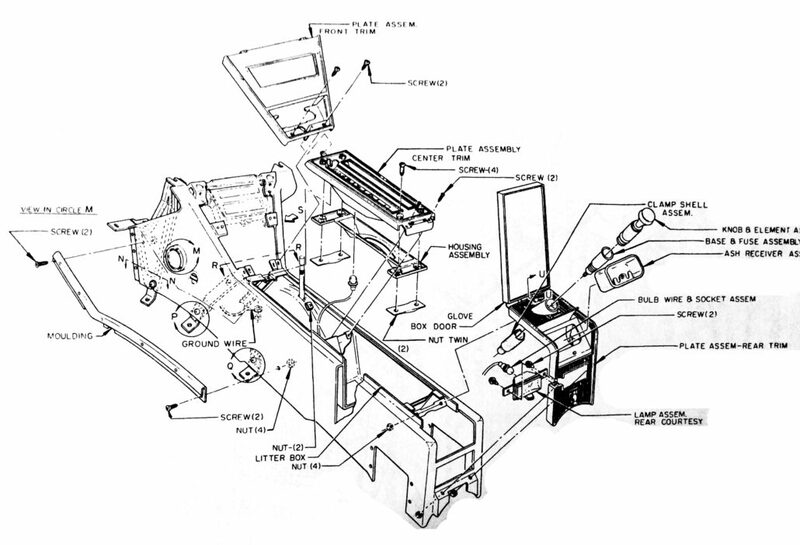 I recommend to use the plans of the maintenance manual to see where the console is screwed everywhere (Fig 1). I thought, I could do this without this manual, with the result that the console broke on two important mounts. Fortunately, I was able to repair the break with a thin aluminum plate and epoxy afterwards. If this should happen to you, this a good way to fix that issue (Fig 2). Once your center console is removed, all other small parts can be removed from the console. When my console was free of all screws and other parts, I had them painted by a professional, along with all the other parts I wanted in the same color (Fig 3). During this time, I have devoted myself to the various small parts of the console like the shifter indicator. Originally, I wanted to buy a new one, but couldn’t find a nice replica for my ‘65. Lucky you if you find an original part in good shape, these parts are extremely rare! So I decided to refurbish the good old piece. I did this by carefully filling the fracture gaps with very fluid epoxy with a syringe needle on the front and from the back. After drying, I polished the whole thing with plastic polishing paste to a high gloss finish (Fig 4). The result is actually quite acceptable. I never was happy with the illumination of this shifter indicator plate, so on that occasion I decided to convert everything to LED. For this I have chosen a LED strip that can be easily glued with hot glue in the base (Fig 5). Now the entire length of the shifter indicator is illuminated in the same intensity. 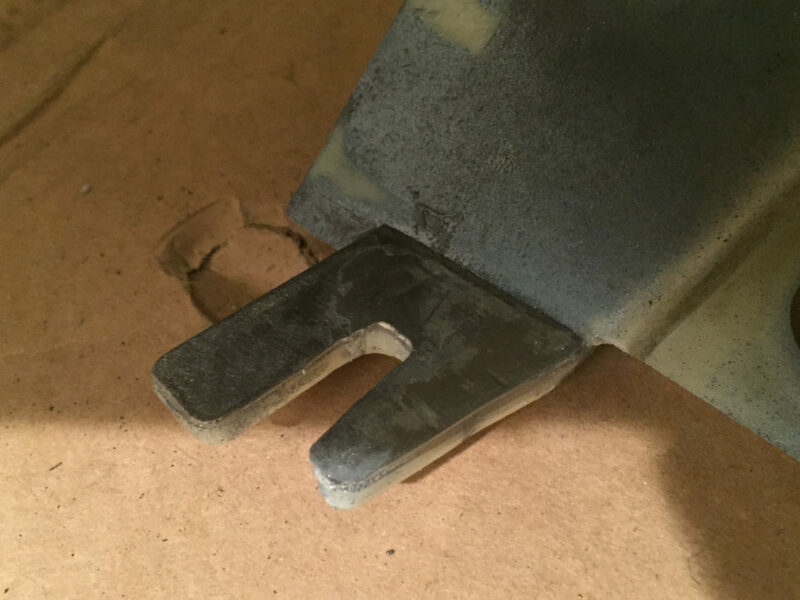 It is important to ensure that the grounding is no longer attached to the light housing, the cables are best connected with clamps. Before the light socket is reinstalled, it makes sense to check the result with a 12V battery (Fig 6). I have changed the whole interior lighting to LED and replaced all the courtesy light lenses with new ones. You can find them easily as a set on ebay and are very easy to install (Fig 7). I also have polished all the chrome parts of the console to a high gloss. The little ribs were filled with stubborn dust but with a little elbow grease, a strong toothbrush and a good chrome polish you can make them shine like new again. In the rear vents, I have renewed the black mat color with heat resistant matt synthetic resin paint, as well as various parts that were originally unpainted. In particular, the inner area of the shifter (Fig 6) has a much more noble effect on black and in this way, visually it forms a clear unit with the shifter indicator. With the same matt varnish, I painted the front of the original radio, the AC and the inside of the console compartment including the lid (Fig. 8). This way, everything works beautifully coordinated. At this point, it seemed to me useful to renew the gear cover because the plastic was damaged. I used a black approx. 1mm thick plastic sheet I cut in the same length and width as the original and drilled the hole for the shifter exactly the same diameter and location as the original. After that, return it to the semicircular guide of the part (Fig 9). 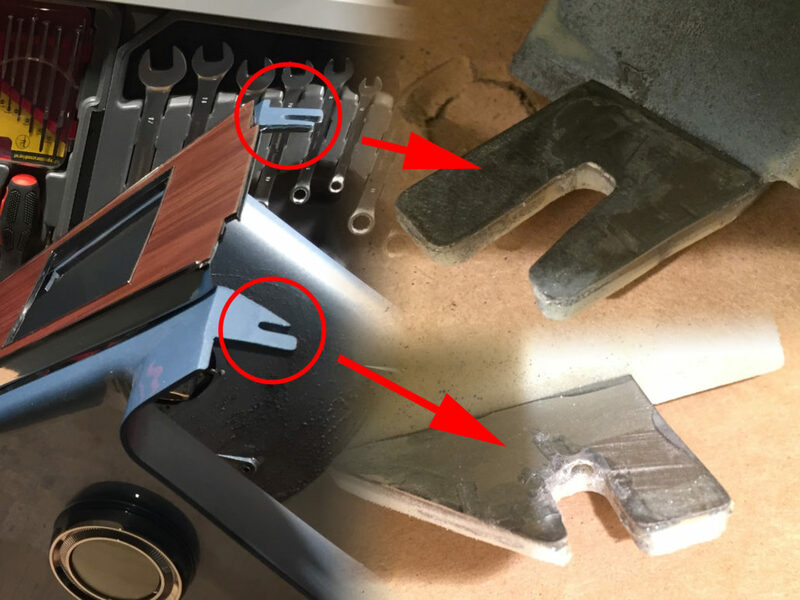 Since I had previously restored the wood veneers of the center console (see also article part 2), I also decided to replace the original plastic knob and make a new one in the same wood as I used for the veneer (Fig 10) which I think, makes it much classier! I replaced the old insulation material on the inner sides of the console with the same sound deadener I used for the whole interior of the car (Fig 11). I used two layers of that material which I think will better insulate as the original glass wool they used before. Once your console is finished and you remounted all small parts again, reinstall the console carefully the way it was. Again, the plan of the maintenance manual as shown in Fig. 1 is really a big help if you encounter some troubles while reinstalling! In the next issue I will explain to you how I approached the restoration of the dashboard.